The Green Phone Booth: Love it or leave it... Or, maybe alter it? By now most of you are in the process of, or have, put Christmas away and moved on to the new year. I would like to have that checked off my to do list as well. Most years I would just shove stuff in boxes or totes and bury it in the basement, not giving it another thought until the following December. This year I am doing things a little differently. Maybe it is the proximity to the New Year, a time of renewal and resolutions. Or, maybe it is just the pit of despair also known as my basement that prompted me to reevaluate things. Storage space comes at a premium in this house. There simply is none. With lots of stuff and no place to put it, one has to be creative to maintain a neat, organized home. Even more so, one has be brutally realistic and ruthless in culling. If you do not love it, why keep it? With the addition of our vintage aluminum Christmas tree this year, this traditional "evergreen" wreath does not really fit our new design aesthetic. Way too much green and a bit too much plastic, but a form I can work with. 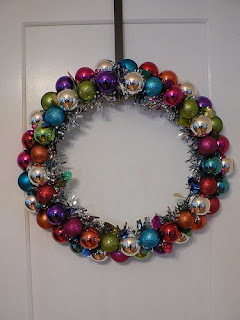 I love the clean lines and pop of wreaths made with bulb ornaments. 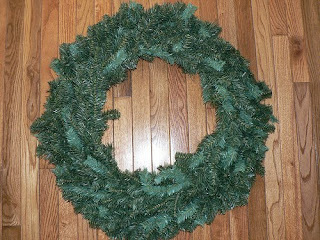 Taking inspiration from our "new" tree, I used the extra bulbs to transform this wreath into one I love. The first step was to remove the top from the wire form. This was fairly simple. All it took was locating the small pieces of wire securing it to the base and unwinding them. 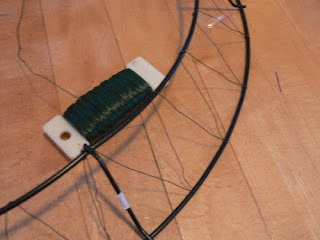 With the base clear, I used florist paddle-wire to wind around the form, giving something to secure the ornaments to. Then I selected the bulbs to use and adhered their hangers to the bulb using hot glue. If you choose not to do this step, beware that the tops may pop off the bulbs when tightening your wire later. 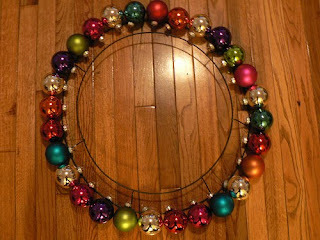 Once the tops are glued on place the first row of ornaments around the wreath form. Weaving in and out of the loops atop the ornaments wind the paddle-wire around the form holding the bulbs in place. Continue around the form until you meet up with the first bulb. Give both ends of wire a pull until taught and twist to secure ends. 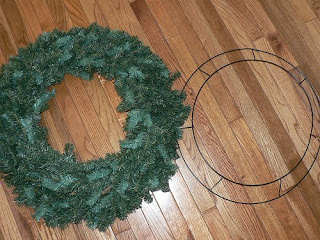 Do the same for row two until the wreath is complete. Very nice makeover! I love it. I love this idea! I love old glass ornaments, but because of the pets, I don't like to put them on the tree and risk breaking/mess/injury. A wreath is safely out of reach. Tres chic! Definitely an improvement over the original! I love it! And I love that you took the time to photograph the process for the rest of us.